In 2003 Ashba founded Ashba Media, Inc. This creative agency was announced the Agency of Record for Virgin Entertainment. AMI designs the look and feel of every Virgin Megastore. They also have other clients, such as Ovation guitars, Royal Undergroundand many more. Daren owns two corporations, Ashba Media, Inc. which handles the art side of things and Ashbaland, Inc. which handles the music side of things.Ashba contributed to Mötley Crüe’s 2008 album Saints of Los Angeles penning all tracks with the exception of This Ain’t a Love Song The title track Saints of Los Angeles was nominated for a Grammy the same yea. English painter,printmaker, pictorial satirist, social critic, and editorial cartoonist William Hogarth was born 10 November 1697 . He has been credited with pioneering western sequential art. His work ranged from realistic portraiture to comic strip-like series of pictures called “modern moral subjects”. Knowledge of his work is so pervasive that satirical political illustrations in this style are often referred to as “Hogarthian” By April 1720, Hogarth was an engraver in his own right, at first engraving coats of arms, shop bills, and designing plates for booksellers.In 1727, he was hired by Joshua Morris, a tapestry worker, to prepare a design for the Element of Earth. Morris heard that he was “an engraver, and no painter”, and consequently declined the work when completed. Hogarth accordingly sued him for the money in the Westminster Court, where the case was decided in his favour on 28 May 1728. In 1757 he was appointed Serjeant Painter to the King. 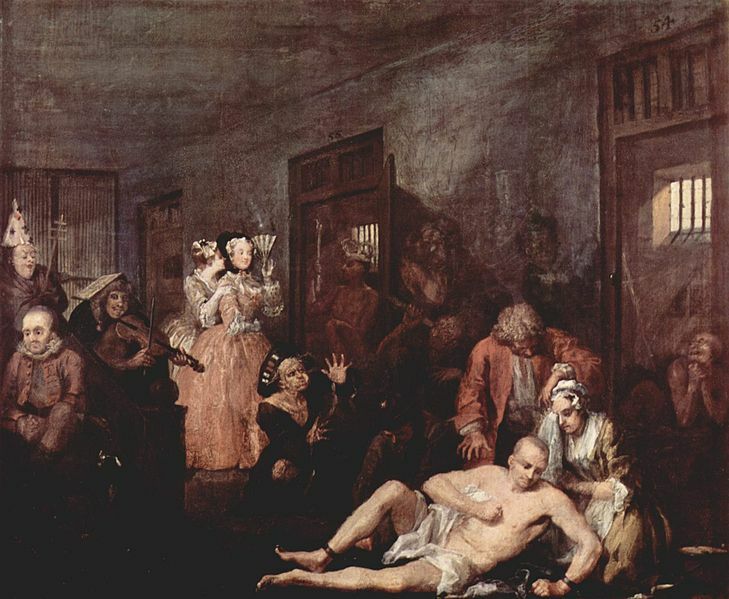 In 1731, Hogarth completed the earliest of the series of moral works which first gave him recognition as a great and original genius. This was A Harlot’s Progress, first as paintings, (now lost), and then published as engravings. In its six scenes, the miserable fate of a country girl who began a prostitution career in town is traced out remorselessly from its starting point, the meeting of a bawd, to its shameful and degraded end, the whore’s death of venereal disease and the following merciless funeral ceremony. The series was an immediate success, and was followed in 1735 by the sequel A Rake’s Progress showing in eight pictures the reckless life of Tom Rakewell, the son of a rich merchant, who wastes all his money on luxurious living, whoring, and gambling, and ultimately finishes his life in Bedlam. The original paintings of A Harlot’s Progress were destroyed in the fire at Fonthill House in 1755; A Rake’s Progress is displayed in the gallery room at Sir John Soane’s Museum, London. In 1743–1745, Hogarth painted the six pictures of Marriage à-la-mode (National Gallery, London), a pointed skewering of upper-class 18th-century society. This moralistic warning shows the miserable tragedy of an ill-considered marriage for money. This is regarded by many as his finest project and may be among his best-planned story serials.Marital ethics were the topic of much debate in 18th-century Britain. Frequent marriages of convenience and their attendant unhappiness came in for particular criticism, with a variety of authors taking the view that love was a much sounder basis for marriage. Hogarth here painted a satire – a genre that by definition has a moral point to convey – of a conventional marriage within the English upper class. All the paintings were engraved and the series achieved wide circulation in print form. The series, which are set in a Classical interior, shows the story of the fashionable marriage of the son of bankrupt Earl Squanderfield to the daughter of a wealthy but miserly city merchant, starting with the signing of a marriage contract at the Earl’s mansion and ending with the murder of the son by his wife’s lover and the suicide of the daughter after her lover is hanged at Tyburn for murdering her huIn the twelve prints of Industry and Idleness (1747) Hogarth shows the progression in the lives of two apprentices, one of whom is dedicated and hard working, the other idle which leads to crime and his execution. This shows the work ethic of Protestant England, where those who work hard get rewarded, such as the industrious apprentice who becomes Sheriff, Alderman, and finally the Lord Mayor of London in the last plate in the series. The idle apprentice, who begins with being “at play in the churchyard” (plate 3), holes up “in a Garrett with a Common Prostitute” after turning highwayman) and “executed at Tyburn” ). The idle apprentice is sent to the gallows by the industrious apprentice himself. This years Poignant Remembrance Sunday service took place on 10th November and was Led by Members of the The Royal Family including Her Majesty Queen Elizabeth II, HRH Prince Philip, the Duke of Edinburgh, HRH Prince William the Duke of Cambridge, Prince of Wales and Duchess of Cornwall, HRH Prince Andrew – The Duke of York, HRH Prince Edward – The Earl of Wessex, The Princess Royal Princess Anne, Prince Michael of Kent and Field Marshal Lord GutJohnrie of Craigiebank. and observed by HRH the Duchess of Cambridge and HRH Countess of Wessex The event included the traditional Laying of the Wreaths and March-past the Cenotaph War Memorial in Whitehall London finishing at Horseguards Parade. This year nearly 10,000 people took part.